Karura forest lies within Nairobi. The forest is only ten minutes drive from the city center. You can access it mainly through Limuru road or Kiambu road. It also houses the forestry department of the Ministry of Environment. It covers more than 1000 hectares. Due to its proximity to the capital city Nairobi, Karura is such a prime public land and thus yearned for by many people (Kenya ranks among the most corrupt countries worldwide and land grabbing is one area where we can see most corruption). Most public land in Kenya has been grabbed illegally by "private developers". As most public utility places (playing fields for schools, shopping centers, roads etc.) have since been grabbed, forests have not been spared. Karura forest is no exception. However it has not been easy for those allocated Karura forest. In the case of forests the process has been that these are allocated to individuals for private developing. This however is done secretly to avoid public outcry. Those allocated hardly use these for the purposes intended to. As a result there has been public outcry and mass action against these allocations. 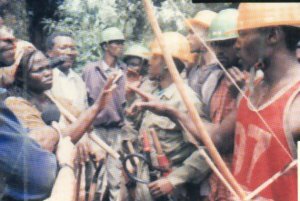 The struggle for Karura forest dates back to 1995. Those initially allocated the plots subdivided them with the intention of erecting residential units. These they in turn sold off to other people who also sold them off. When finally some people tried to construct roads to pave way for residential estates, leading opposition figures and environmentalists mounted a spirited fight to stop the grabbing. At one instant construction equipment worth more than Ksh. 80 million was burnt down by an irate public led by key opposition MPs. This equipment however belonged to the company contracted to construct the roads but not the people allocated the land. So the contractors filed a case in court. After this incident private guards were mounted at the construction sites These are normally armed with crude weapons and very hostile. However there have b een a series of running battles between the police and the public. In some instances university students have also joined in the fray. At one time when the government was taken into task to explain or clear the saga it was alleged that files containing details of the people allocated the land had gone missing. In some instances also names of the companies allegedly allocated these plots have surprisingly become nonexistent from the registrars office. If Karura forest was grabbed and turned into a residential area, it is quite obvious, that Mji wa Huruma would be the next victim, because it lies just opposite the forest and people who might then live in those houses would not like the sight of a slum every day.